Same berry flavor as Genie cartridge material. Working time for standard set is 2'25"; 1'40" for rapid set. Setting time for standard set is 4'30"; 2'30" for rapid set. Contains: 1 x 300ml base (purple), 1 x 300ml catalyst (white), scoops. Genie was used by 13 consultants in over 200 impressions. This product received a 96% clinical rating. 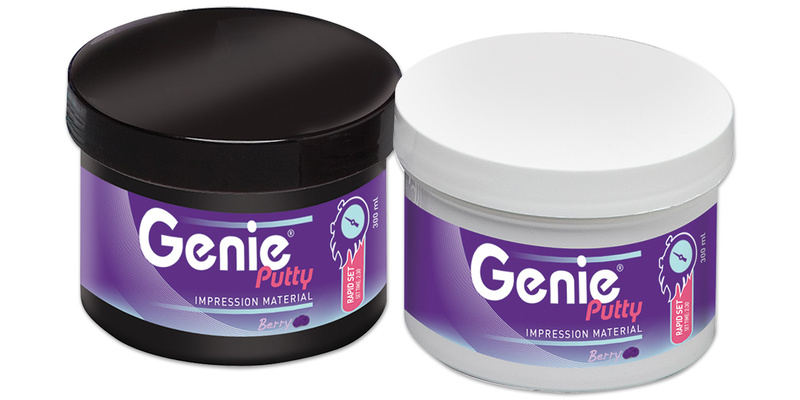 Genie is a berry-scented, addition silicone impression material system intended for all impression techniques. The material is available in putty, heavy, regular, light, and extra-light viscosities. Both a rapid set (2:10 minutes) and a standard set (4:30 minutes) are available in each viscosity. Fabrication of gypsum casts should be delayed for 30 minutes and epoxy casts for 60 minutes to avoid porosity. Impressions may be stored for up to 2 weeks before pouring. Consultants who evaluated Genie were using a variety of impression materials and techniques. Ratings of very good to excellent were given for the packaging, dispensing and delivery of Genie. Consultants were happy with the variety of viscosities in both standard and rapid set. The working and setting times were found to be very good. The color contrast of the materials was judged to be excellent and margins were easily read. Consultants noted that the berry scent of the impression material was pleasant and appealed to patients.